This winter sport of curling was originally played on the frozen surface of the GRAND RIVER from 1839 till late 1870’s. Curlers began using the river behind the buildings on Mill Street in 1839-- 1840’s. It was a rather attractive location as spectators could gather on the balconies of the buildings and alongside the Victoria Street Bridge to watch, and the popular bar room of the Commercial Hotel was only steps away when players wanted to warm themselves. Sometimes lanterns were hung from the bridge for evening play. Playing on the river did have a lot of disadvantages, like thin ice, shoveling of snow, and poor weather conditions. During the summer of 1879 a group of merchants got together to build a proper facility and the sport moved indoors. The result was the ELORA RINK CO --later known as THE ELORA CURLING & SKATING CO. The rink company bought two lots on the north side of Peel St—now known as Mill St. (corner of Mill and Metcalfe St) and built a building 70 ft. by 156 ft. that held one sheet of ice, which both skaters and curlers used, and a space for spectators on one side. The building changed hands several times between 1879 and early 1900’s when hockey began to use the facility, which brought a lot of revenue to the town. The building unfortunately was lost to fire in 1908. Elora had to wait 12 years for a replacement building. Meanwhile curling continued to be played alongside hockey on an outdoor rink at the corner of Geddes St and David St. In 1915 the company running the outdoors rink started a fund, raising money and with this capital started a new company in 1919 known as the Elora Recreation Co. They bought land between Chalmers & Queen St. (across from the old public school) purchased a used building in Preston, and then moved it to this location in Elora. In 1920 a new multi-purpose rink was established to accommodate hockey, skating, and curling. During the late 20’s—early 30’s the Elora Recreation Company was having a lot of financial problems, and again this facility was lost to fire in 1933. At this point the village of Elora became involved in a new arena project, leased land on the west side of the David St bridge (the site of the present curling club) to the Elora Recreation Co., which built and opened a new arena in Jan of 1934, to provide skating and hockey for the community. Alongside the new arena was a two sheet pad of ice built for curling only. Curling was suddenly halted in 1941, and club records do not resume until 1945. Between 1942 –1944 during the Second World War the facility was used to store bales of wool to be used to make uniforms. In 1945, when curling resumed, everyone was responsible for their own rocks. Today the rocks are provided by the club. Curling was mainly a male dominated sport, as very few women played the game until the late 1930’s. In the late 50’s- early 60’s, women began curling in this area, when the women organized and started their own league. Not until the early 70’s, did the men and women join forces and formed one executive, as it remains that way today. Up until the early 1960’s the game was played on natural ice. The season was very short, starting after New Year’s and ending Mid February sometimes. Some curling seasons would only have 10 or 12 games and maybe 1 bonspiel depending on the weather of course. In 1963 the facility was outfitted with artificial ice which made the season a quite a bit longer and allowed the club to play more bonspiels. In 1970 the hockey arena was condemned by the provincial government and had to be torn down due to safety reasons. A few years later the village of Elora built the present Community Center on the location it is today. It was at this time, the small 2 sheet Curling Club saw an opportunity to expand, so they signed an agreement with the town to purchase the old arena floor and ice making equipment and built the current Curling Club which officially opened in 1976. In 1989 the Club celebrated its 150th anniversary with a large banquet and dance at the community center, with many local dignitaries from the community as well as representatives from the neighbouring clubs such as Fergus, Guelph, KW Granite, and Galt attending to honour this special occasion. In 1990-1991, major renovations and an addition were added to improve the kitchen facilities, and change rooms of the club. This was achieved with a 10 year advanced membership program, donations by the membership and also a loan from the bank. The Elora Curling Club was heavily involved with the International Plowing Match held in Elora in 2000. The money raised was used to replace the ice condenser unit. In the early 2000’s another major renovation was made to the club room and bar area, to make the club room more accommodating for rentals and private parties. This was achieved through grant monies received from the provincial government. In 2013, the club kicked off its 175th celebration with a banquet, and in attendance was the world champion rink of Glenn Howard along with another world champion Jennifer Jones. Later in the curling season (2014) a bonspiel was held to honor this special occasion. In 2017, after applying for several grant applications, the club received grants from the provincial government, one grant having to be matched with club money, thus receiving enough money to replace all of the ice making equipment along with a new energy saving lighting system making it the club it is today. With close to 200 members today’s club is a very busy place. 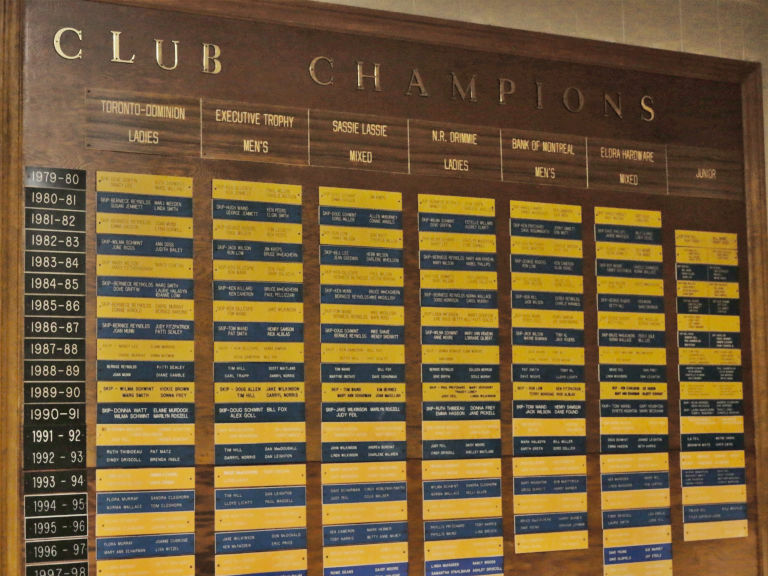 With leagues scheduled for every day of the week including Sundays (daytime as well as evening curling), there is something for everyone who would like to enjoy the game. The club also has a very active junior program and is involved with several schools in the area to promote curling for school children. 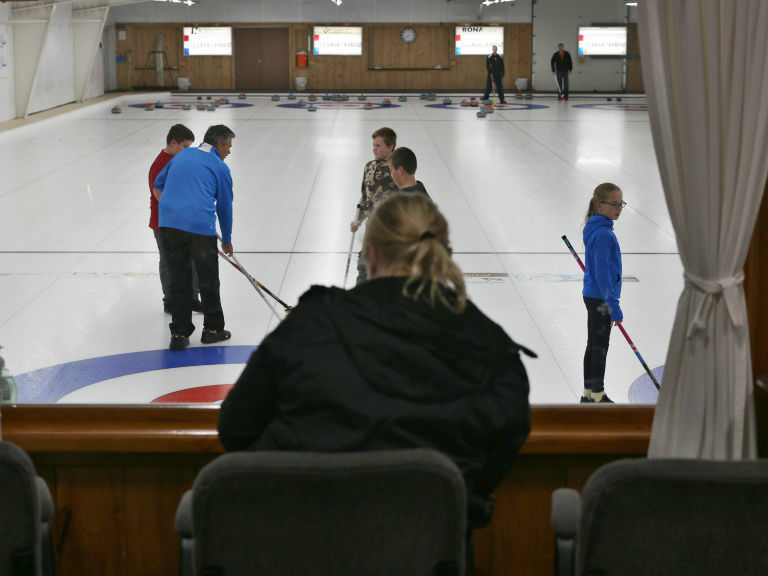 The combination of friendly competition, fellowship and community pride are only a few of the many elements that have helped to sustain and make the Elora Curling Club what it is today.